There’s a lot to be said about the old adage when you’re grieving over an animal go spend time with the ones you have. Last night Lauren was surprised in her bed by three of the cats, George, Izzy, and Jack Cat who never came upstairs when Sebastian was alive. Now they are very happy to come up and spend time with Lauren. And it was great for her to have their company. Today was just spent with the horses, cats and dogs on a beautiful Texas spring day. While Lauren was up at her trainer’s riding I was down at our barn riding my mare, Nova. Lauren rode three horses while I rode one but I am pretty old. I had just gotten off when she got home and was hoping she would join me at the barn. The next thing I knew she was in the pasture hanging out with Sims and Mickey. 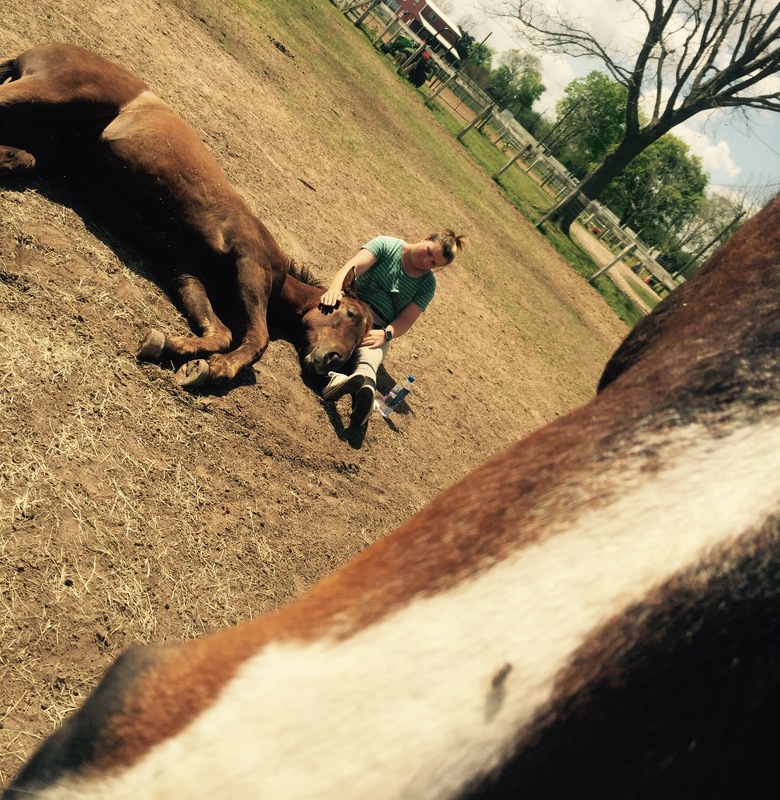 Sims was taking a sunbath and she got down next to him which for those of you that don’t know horses, most horses will not let you come stand next to them or be on top of them when they’re in that type a vulnerable position. Centuries of being prey to many other animals have kept them from trusting anyone near them when they cannot get up. 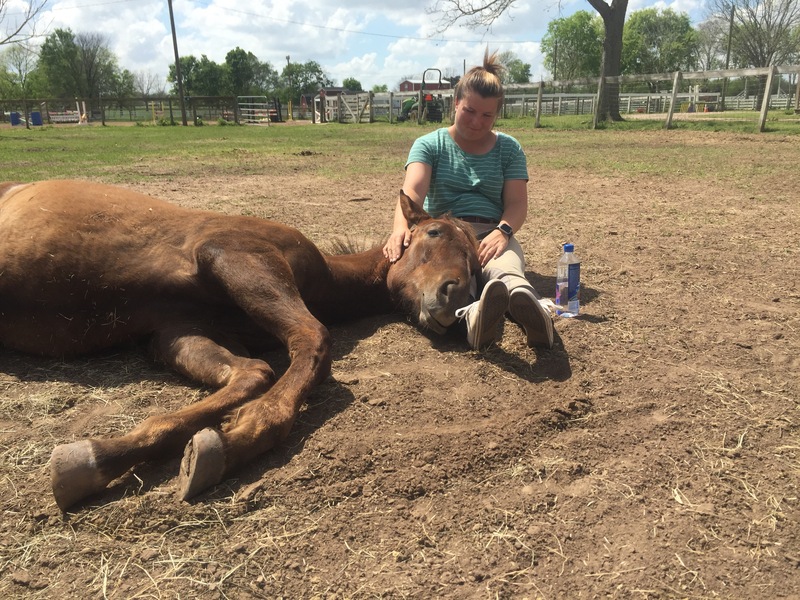 But Sims loves his Lauren and he was perfectly content to lay there with his big body in the sun while she patted his head and gave them a lot of love. Her boy Mickey, not to be left out, kept a close eye on the whole deal. Later in the afternoon I worked some more on cleaning up the weeds that have grown instead of my plants. Hopefully later this week Lauren and Ally will get me a flatbed full of mulch and I can get all these beds completed. I love my gardens!! My back does not love gardening so much. Oh well. Thank you to all they gave us such kind notes about the loss of Lauren’s cat. It was very much appreciated. Hope you all are having a terrific Sunday afternoon. As always, thanks for riding along. This entry was posted in 2017 Lent Writings by Exechorseluver. Bookmark the permalink.